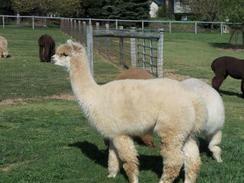 Get a Warm Hug from Nature at Eastland Alpacas! Donte is an outstanding Herdsire. He has beautiful dark brown fiber with coverage from head to toe. He stands proud with his excellent conformation and has good straight legs. He is easy to work with, which carries through to his crias. Donte's cria stand very proud and have terrific confirmation. It is easy to pick them out of the herd. He passes on his straight legs and topline to his offspring. If it's confirmation you need, Donte is the guy for your girls. We are very pleased with his offspring! He produces very nice "girls" for us. Freckles is half Peruvian and has great conformation and a friendly disposition. She has good fleece quality. Her grandsire is Peruvian Hemingway who has produced many show winners and has consistently maintained a low micron count. She has given us wonderful cria's. Most of Freckles cria were girls. She is an easy birther, has plenty of milk and is a fantastic mother. Freckles is a gem!! Genna is a good sized girl. She has a very soft fleece. She is ready to be bred. Choose one of our herdsires in which to breed her to when you purchase Genna! We will create a payment plan just for you. Up to 12 months, 0% interest with 1/3 down payment. Payments can be made monthly or quarterly. Terms are available for up to 24 months, 8% interest with 1/3 down payment. Payments will be made monthly. Pet quality fiber boys to be paid for in full upon delivery. Free board for up to six months after purchase and free delivery within 100 miles of our farm. Buyer may take delivery with downpayment. The registration of the financed alpacas and any crias will remain in our name until paid in full. After alpacas are paid for in full Eastland Alpacas will at that point pay for and transfer registrations to new owners. All alpacas are guaranteed to be healthy and injury-free at the time of sale. We offer a 30 day live birth guarantee.